The company’s founder and current managing director Vidmantas Gurskis remembers business start as a logical outcome of previously held marketing. The company was established in year 2000, when a Russian financial crisis ended. The company was one of the first to gain trust to represent the well-known worldwide pharmaceutical companies such as - F.Hoffman-La Roche, Serono Incorporation, Solco-Basel, Novartis Consumer Health. „Vigifarma“ was successfully distributing medications of international pharmaceutical giants such as – Abbott Laboratories (now AbbVie), Berlin-Chemie (Menarini Group), Egis AG, Pfizer, Polfa, Sanofi-Aventis (now Sanofi), Schering AG, Servier International and many others. Driven by enthusiasm, the hard-working and keeping the order in all agreements during years “Vigifarma” team had achieved the respect and trust of all suppliers. This helped to work under the best commercial terms with the main partners. Experience and mutual trust enabled the Hungarian company Egis to open customs warehouse in Lithuania and entrusted „Vigifarma“ to be their representative for Byelorussia and Lithuania. „Vigifarma“ assisted to some big multinational companies launching business in Central Asian market. It would have been very difficult or even impossible for Westerners to do so. One of such success stories can be co-operation with worldwide pharmaceutical leader Abbott. „Vigifarma“ used its business contacts for entering Uzbekistan and Turkmenistan with Abbott's products. The company has its representative office in Turkmenistan, participates in international exhibitions and state tenders. 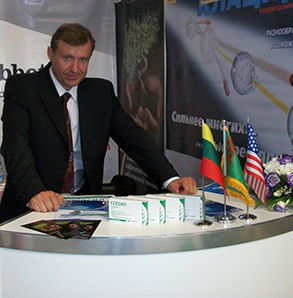 „Vigifarma“ business fields are not only wholesale of medicines but also of medical supplements and equipment. The company was awarded by Turkmenistan Ministry of Health for delivering dental and laboratory equipment. The company complies a policy which consists from such great ingredients as keeping commitments delivering goods in time, manufactured following EU standards and in the manner which is the best for an enduser. This helped to achieve great business success and retain world's major pharmaceutical leaders trust for years.